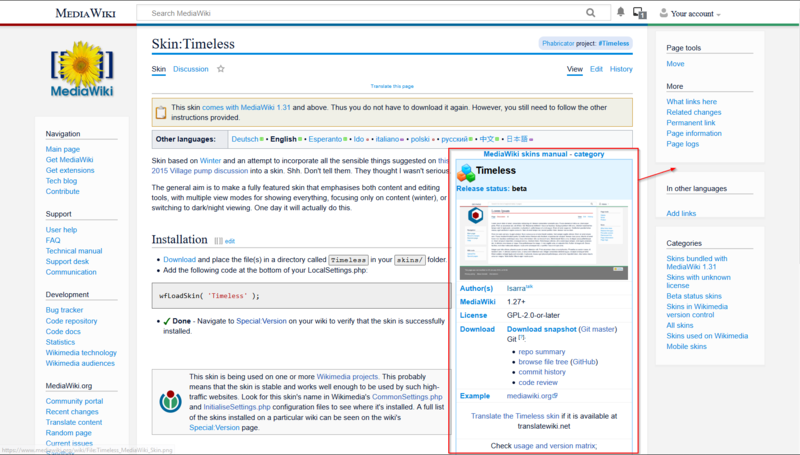 Dear Isarra, Welcome to MediaWiki.org! 2 "No policy survives contact with users"
9 How to keep CategoryTree stayed opened after going back? 14 Adding infoboxes to Timeless right-side whitespace? "No policy survives contact with users"
qqx is relatively new; won't be supported on older target wikis - wafflelanguage it is? How to keep CategoryTree stayed opened after going back? Thanks again for your work on Timeless ! As you know the skin was deployed yesterday as a beta feature on French Wikipedia. The community was happy to discover this novelty. Following the announcement, lots of users have made different remarks, in French. Note that a few of them only concern our website, and its templates and css. Adding infoboxes to Timeless right-side whitespace? @Jorm: Yeah, I can't seem to replicate this on any chrome on linux (I was a bit out of date, so I updated and tried the beta/dev channels, too). Upon scrolling up, there's a delay point (when .mw-content-container breaks the upper viewport bounds) and at that point .mw-header-container disappears but .mw-header-hack remains. The rest of the page (.mw-content-container) is visible through the box. Hovering over the Username link (#personal) causes the header to reappear and the menu to form. The menu can be interacted with but hovering off that or the username causes it all to disappear again. It appears that all elements in the header work. It gets the typing cursor when over the searchbox, for instance, and clicking in you can type (but you can't see what you're typing); hitting return executes the search. The Echo buttons are operative as well, and clicking them opens their menus but it does not show the bar again. Does not happen in Firefox. I thought maybe it was a z-index issue but it isn't. It feels like an opacity issue, but I'm not seeing any css that would affect it. @Jorm: Man, that is just strange. I tried the same version but everything seemed normal, but this really does sound like it's chrome... have you tried the dev build to see if it's still happening there? @Jorm: As much as I can in my spare time. That's why I've been requesting funding to work on all this properly, because there's not much of that to begin with, and I also have other projects that are just as interesting competing for my attention.